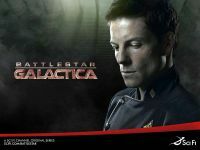 Subject: BSG 212 - Broken Toast - GAME OVER - Cylons Win! Welcome to the Battlestar Galactica play-by-forum game "Broken Toast". This will be a Base game with 5 players. 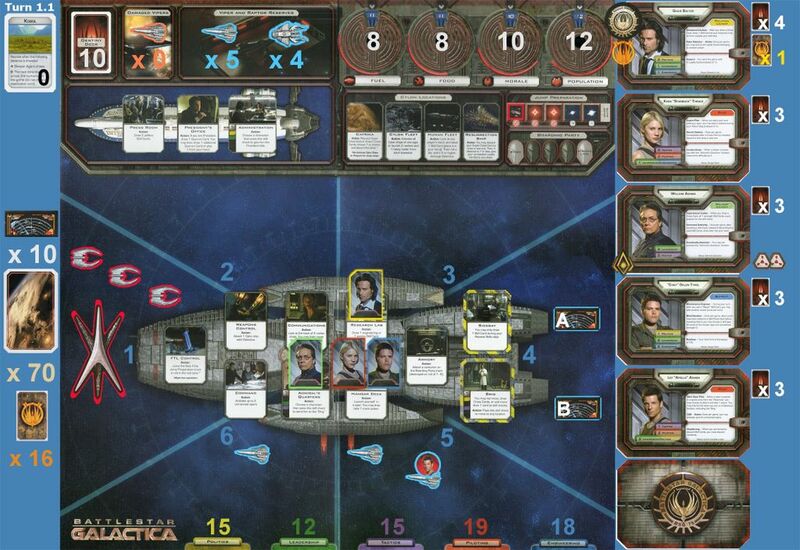 Players are expected to be familiar with all the rules of Battlestar Galactica, especially the rules of secrecy regarding cards. Each player also needs a copy of the game, because I am only allowed to reveal card names, not texts. Players are allowed to post game discussions and tactics discussions in normal text like this. Italics are used for roleplaying and flavor, which often adds good ambience and fun to the games. Bold text is used for orders. Examples of orders are moves, card plays, actions, attacks, and other things. I will not take an action for your character unless posted in bold. I will ask that players not geekmail/email each other to discuss game tactics in order to keep knowledge from other players. The nature of the game is that all table discussion is heard by all players. That being said, it is allowable to geekmail certain instructions to me rather than posting (like playing Investigative Committee or Strategic Planning). Conditional orders, in order to speed up gameplay, are also acceptable and greatly encouraged. I will expect all players to keep on top of their Once-per-game ability. I will not prompt for these, so if you believe you may use it, post it or send me a conditional order. Please try to check the board at least once or twice a day so that we can get through people's turns in good time. My timezone is US Eastern (GMT-5). When posting a skill card play, please use color codes with lowercase color (Ex: color=purple instead of COLOR=#990099) as these are the color codes I will be using on all my posts. This will make it easier to follow for everyone. I will send card draws and hand reminders via geekmail. Players are, of course, urged to keep track of their hands. All die rolls will be handled by the BGG forum die rolling tool and will be visible in each post. Checking in as an alternate! I'm around, let me know if needed. Excellent name for a game. Okay, let's get this show underway. geddoe, JackBurden, Bexarath, tuathail and tipbruley are in. tuathail, you are first to select a character. Others may send COs for character choice, and/or starting card draw. This is the only time public COs are allowed. How's it going everyone! I'm guessing base character's only? 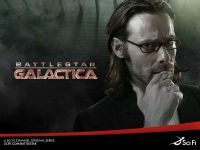 I haven't played him in a while now, so I'm going to choose Gaius Baltar. 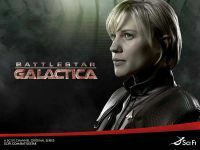 I've never really played a pilot, so I'll go with Kara "Starbuck" Thrace. For my starting hand, I'll take 2 Tactics and 1 Leadership. 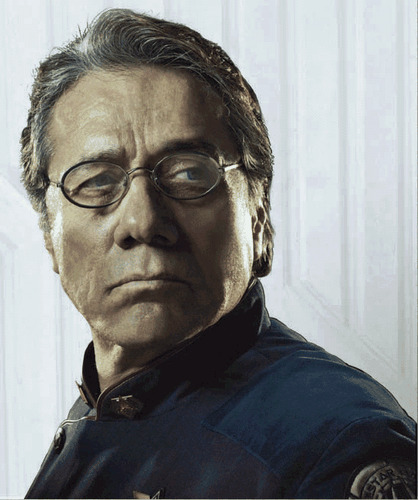 By CO, JackBurden selects William Adama and draws 2 Leadership and 1 Tactics. Unfortunately, Chief's skill set only allows for 1 Politics to be drawn, you'll have to change your starting draw. You're watching Cyfy, the Cylon science fiction channel! 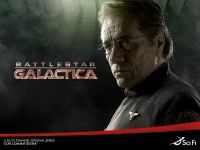 Coming up next on Cyfy, it's a new episode of Battlestar Galactica! This has happened before, and will happen again. Oh look, another human ship is trying to go to Kobol. Apparently, there are many copies of these humans. It's almost like they were cylons or something. How will this episode turn out? Stay tuned! Loyalties and card draws are on their way, Baltar can post his turn when ready. This is the Admiral. Set Condition 1 throughout the ship and prepare to meet incoming Cylon raiders. Lt. Gaeta, begin plotting our next jump. I think we can all agree that at a time like this it's important to let the military take care of military matters without .... well, what I mean is .... If you need me, let me know, I'll just be leaving here now. Discard 1 - Repair to move to Presidents Office. Dr. Baltar was busy holding teleconferences in his office and didn't even notice someone walking right up to his desk with bombs strapped to his body. "How the frak do people get in here so easily?" Baltar shouts. Baltar may draw a card for Delusional Intuition. Looking for Investigative Committee or Scientific Research. This is ridiculous. I have important work that needs to be done here. Vital to the smooth governance of this fleet, and someone let's this madman with a bomb on to the ship. Where was security? I want this investigated. For the skill check itself, I can't do much (until I see what that new card is), but we have a lot of the right colours between us and I think we should try to pass it as it's never a good time to lose morale. No question, we should definitely try to pass it. Should be fairly easy, too. Chief and Apollo, how much can you help? Baltar pushes a button behind his desk. After a few agonizing seconds, he gets an answer. "This is Saul Tigh." "Tigh, I need help here!" Baltar shouts. "What seems to be the problem?" Tigh slurs. "There's a guy with a bomb here!" "Oh...okay. I'll deal with it." "Tigh, have you been drinking?" Baltar shakes his head. "Just deal with it..."